This “self-absorption” does not mean that the work is strictly self- referential. Although it is an intimate world revealed, it must also carry an attachment to a more universal depth that is seeking form. When one dreams, one knows that it is his or her dream alone. No one else is having this dream. But one also realizes that there is a larger purpose at work in the dream. It is identifying something that needs our attention. A work of art must carry a sense of completion and must also act as a conduit between itself and the world. As Lorca would say it must have duende– a hunger, a longing, a depth that draws one inward to a recognition of the desires of one’s heart. Without duende the work will not “live”. This painting is so wonderfully vibrant. I love how the color is so bold and at the same time harmonious and subtle. I also love how the the fore ground leads me in to the dynamic scene. 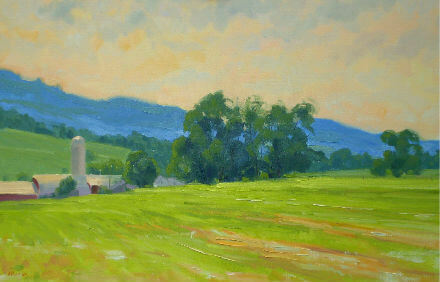 The buildings- especially the shimmering silo- so precise are a perfect counterpoint for your exciting brushwork. What a dizzyingly beautiful world I enter when I look at this painting.